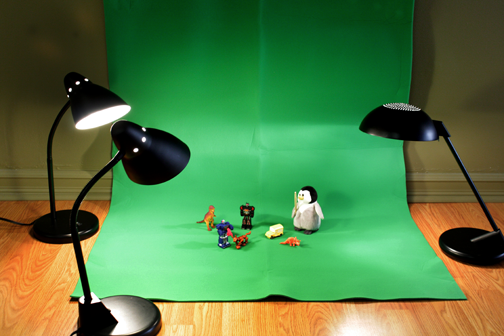 Before you begin, it is important to gather the characters that you intend to use and set up a stage on which to record your stop-motion animation. When deciding on characters, it is best to look for or create figures that have ball and socket joints for full rotary movement. Just like a cut-out puppet, you want to be able to move your principal character at the shoulders, legs, knees and elbows if possible. If you choose to create or use characters that have less mobility, your animation might look a little stiff, which is not necessarily a bad thing if this is the look you want.